Mike Myler’s doctor is a cool, interesting class – in light of the issues cleric etc. 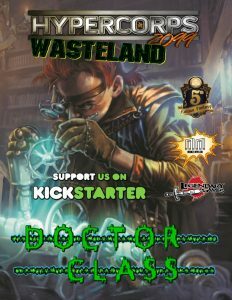 will face in the radioactive wasteland, there will be plenty a group where these non-magical healers will be all but required. Similarly, the non-divine healing engine provided here is potent, but not overtly so and leaves stuff for the doc to do beyond being the heal-bot. Considering that this is FREE, it is definitely worth checking out, particularly if you wanted a non-divine healer for any type of 5e-game. Well worth getting, 5 stars.